Last week my husband and I traveled to Asheville with our friends John and Jackie to celebrate our fifth wedding anniversary. Hold on. . . that is not completely true. 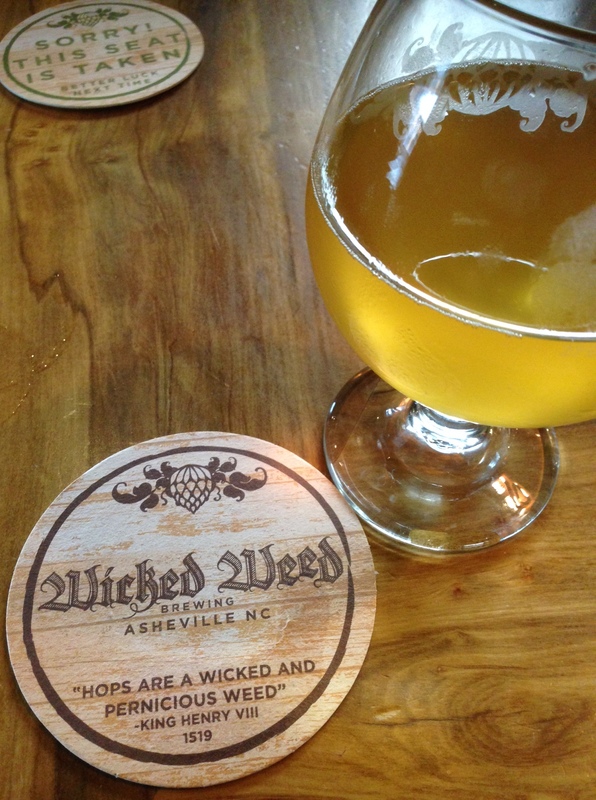 Last week my husband and I traveled to Asheville with our friends John and Jackie to taste some of the best beer in America; and it just so happened to be close to the same time as our fifth wedding anniversary. Yeah, that is more like it. Whatever the reason, we traveled three hours to reach a place I call my new Shangri-la. We ate, drank, drank some more, walked a lot, then needed a few more drinks and a pint of bacon(YES!) to refuel from all of the walking and drinking. 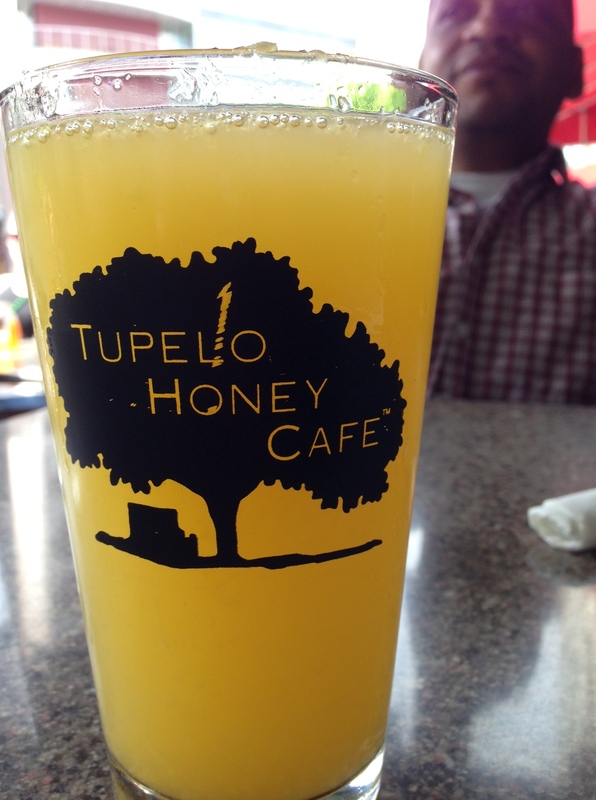 Here is a rundown of what we ate, drank and loved in the cutest town in between the mountains. 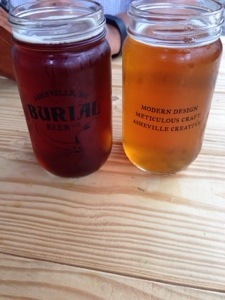 Burial Brewing was highly recommended by former and current Asheville residents and with good reason. It was however a bit hard to find; but good things come from hard work. This place welcomes kids, dogs, and food deliveries(they only have pretzels at the bar). 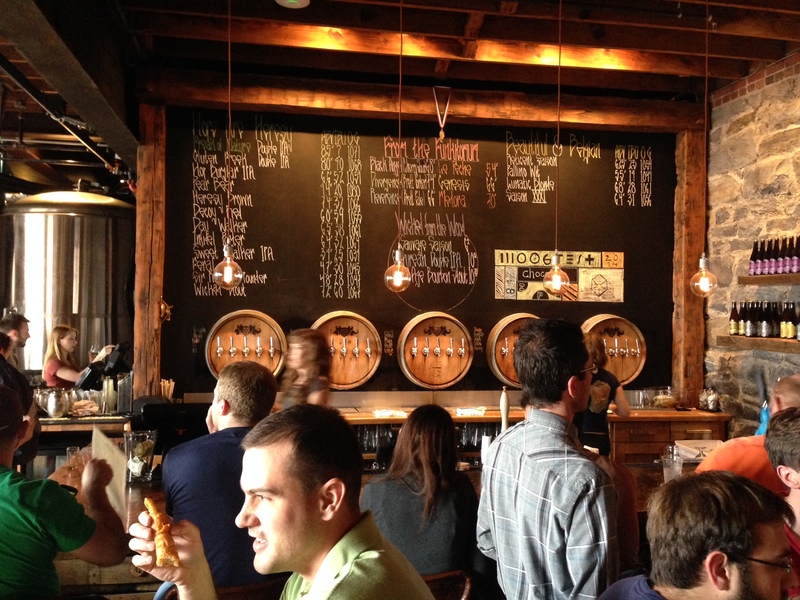 I enjoyed their Pitchfork Saison and Scythe Rye Pale Ale. They also do a Skillet Donut Stout that comes with a donut hole on the side. While I was not in the mood for a darker beer on that day, John and Joe enjoyed it throughly. We stumbled upon the Twin Leaf Brewery on our way to another location. This spot has only been open for two months and smelled of freshly cut wood and boiling wort. If that combo doesn’t make you stop and stay for a while the amazing collection of beers on tap will. At the time of our visit they were’t doing growlers yet but they soon will be. I enjoyed their Belgium Style Wit -White Noise, American Style IPA -144(Code Name Juicy Fruit), and the Dark Matter Oatmeal Stout. I licked the plate/bowl of Brunswick Stew and Mac & Cheese Pie from Doc Brown’s BBQ Food Truck . This truck was on the Green Man Brewing property and could not come soon enough in our day. It went very nicely with their Green Man IPA. I destroyed the popcorn with vinegar and sea salt, a ham/salami/cornichon and fig marscarpone sandwich, Day Walker Ginger Infused Ale, Heresy Brown Ale, Reticent Saison, Sweet Talker IPA, Moogfest Chocolate IPA, and Infidel Porter(brought home a growler full) from Wicked Weed Brewing. Did I mentioned that we went to WW twice during our trip? You didn’t think I drank all of those beers in one visit do you? 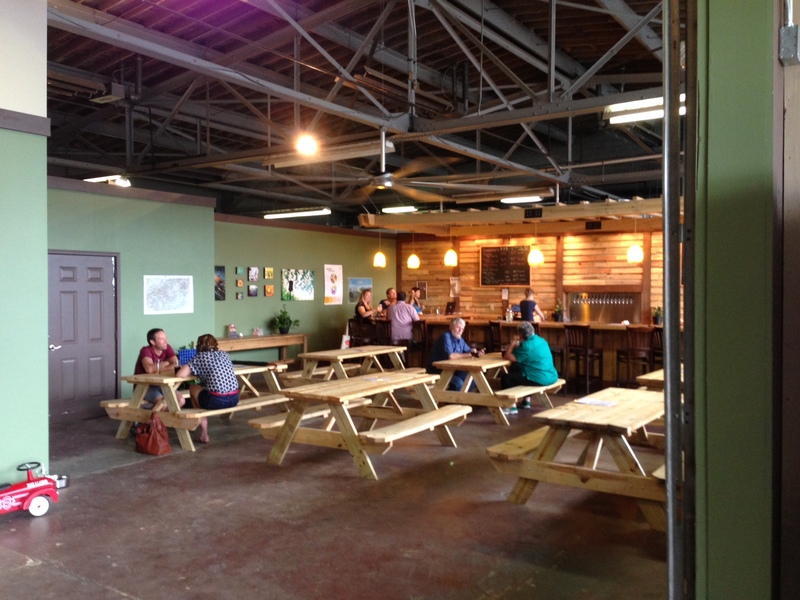 I enjoyed a Bed of Nails Brown Ale and a few rounds of shuffleboard at Hi-Wire Brewing. I only had one drink as it was the last stop at the end of the day and my belly was quite full. 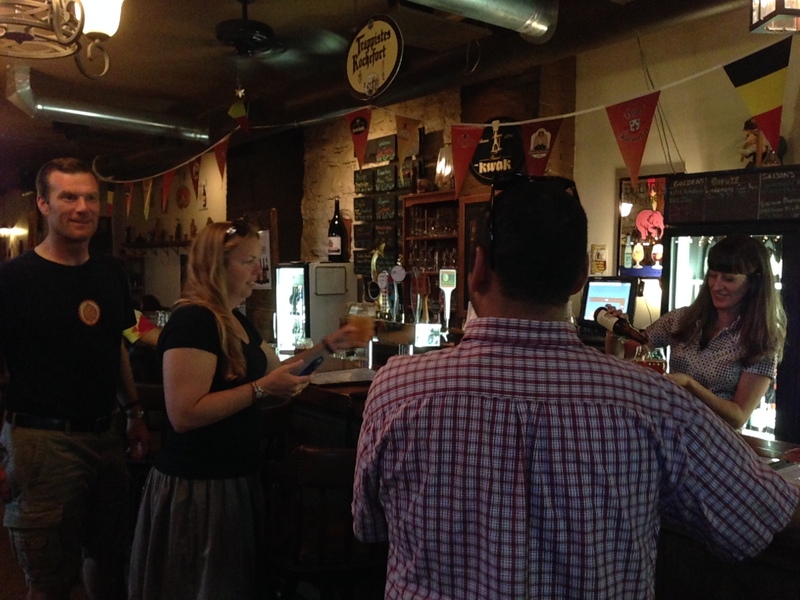 The gang checking out the selection at the Thirsty Monk. The Thirsty Monk has a basement that I could live in. While the upstairs is nice, down below lies the promised land. Stocked to the gills with Belgium brews it is a cozy dimly lit spot with a beer lover’s dream menu(pint of maple and peppercorn bacon anyone?) I had the Ovila Saison by Sierra Nevada and one of my all time favorites Matilda by Goose Island. Both went very well the the bacon by the way. If only I could move this place to Decatur. The low point of our trip would have to be Lexington Avenue Brewing. The nachos were amazing but the beer was not the knockout experience I was looking for. Maybe I chose the wrong brew? Better luck next time. Midway though all of this eating, drinking, and walking we were all thinking about when we would be able to return. Believe it or not there are still breweries that we did not visit and beers we were not able to drink.